Scream allows you to apply filters of your own design to WaveView windows. In the WaveView window, next to the Filter Streams icon , there is now a drop-down menu. From this menu, you can choose from a list of filters to apply, or design a new filter. Each WaveView window can have its own filter settings, either using a preset filter or one you have designed. 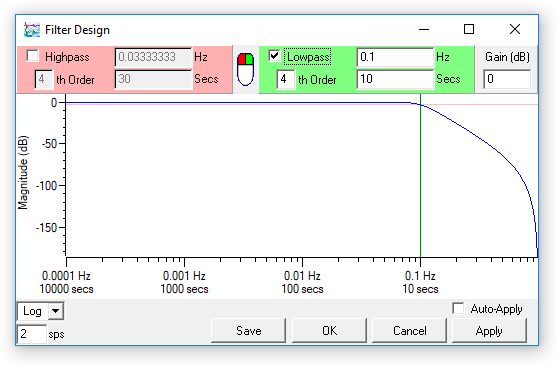 You can use this feature to view the same data in several frequency ranges at once. To open the Filter Design window, click on the drop-down menu button and choose Design…, or press Ctrl-F whilst the mouse pointer is over the Waveview window. When it is first opened, the WaveView window shows unfiltered data. In these examples, the data was collected from a 360 s 3TB instrument at our test vault in Wolverton. The raw data shows a typical profile of events, microseisms and noise covering a period of 4 weeks. Teleseismic events can be observed by applying a low-pass filter to the data. A filter with 10 s corner frequency effectively removes signals from natural microseisms. Earth tides are now visible in the window. 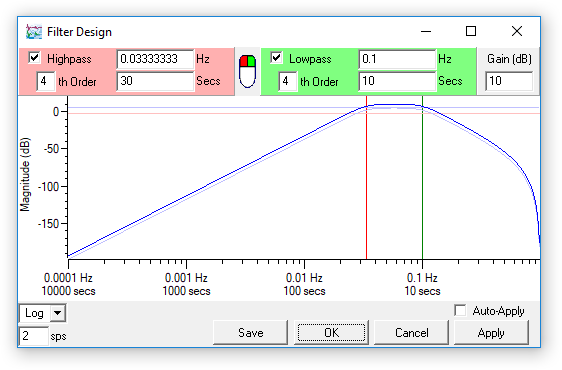 The Filter Design window shows the response curve of the filter that Scream! is applying. 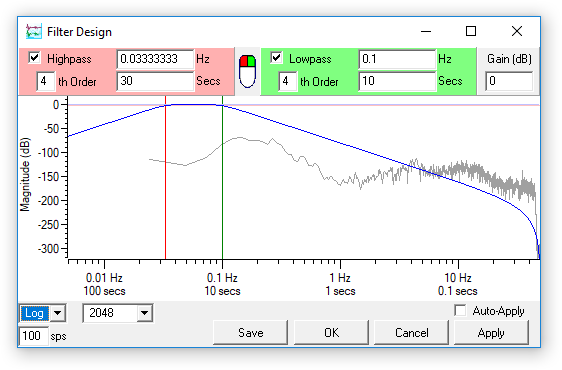 The corner frequency and −3dB level are marked in red. Dragging the corner frequency marker changes the characteristics of the filter. 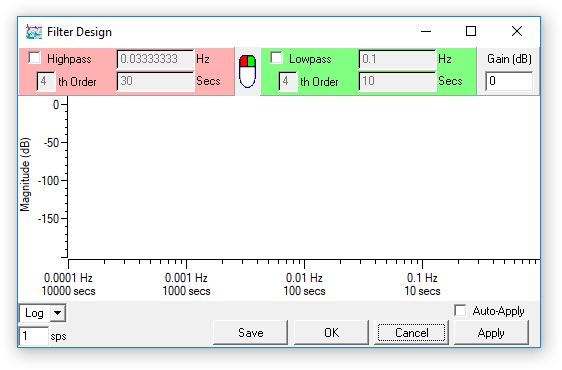 You can also enter numeric values directly using the Hz, Secs, Gain and Order boxes. 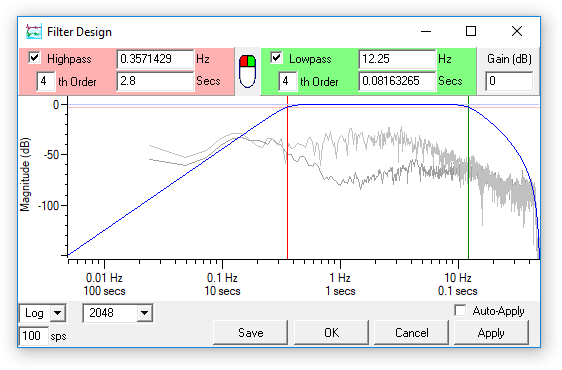 With Auto-Apply ticked, the Waveview window updates in real time as the corner frequency changes. At 5000 s, only the earth tides remain. The daily pattern of tides is clearly visible. To isolate the teleseismic events, we need to use a bandpass filter. 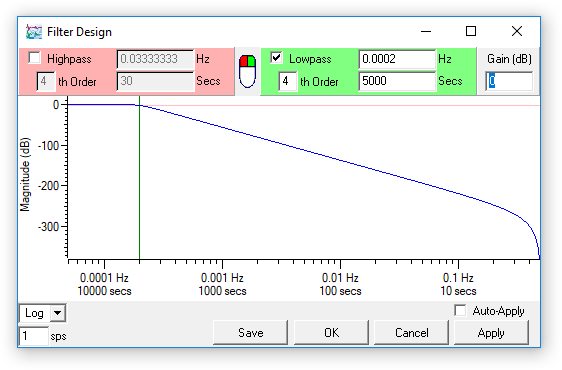 In Scream!, this is done by checking both Highpass and Lowpass boxes. The Filter Design window shows the high- and low-pass filters in light blue, in addition to the resulting bandpass filter. Here, corner frequencies of 10 s and 30 s have been used. To isolate local events, a high-pass filter needs to be applied, e.g. with a corner frequency of 5 s.
The 1 sample/s data used for this plot is not very suitable for studying local events, since much of the information is above the Nyquist frequency at 0.5 Hz. Noise from microseisms is also clearly visible. However, we can still see the major local event in this time period. To study a high-frequency event in detail, we need to change to a data set with a higher sample rate. A small earthquake occurred 15 km directly below the Wolverton vault in February 2006. The raw data are dominated by microseisms, but the event is still clearly visible. Dragging with across the trace pops up the menu for Scream! extensions. 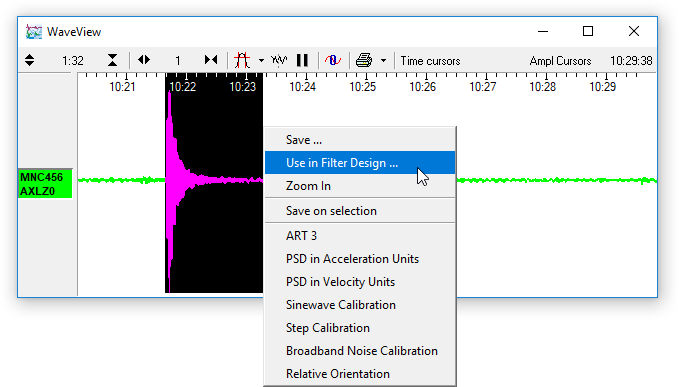 This menu has an item, Use in Filter Design…, which calculates the frequency spectrum of the selected region and overlays it on the Filter Design window to help you set the filter parameters. Scream! uses the Welch averaged periodogram method to calculate this curve. A control is provided which lets you change the size of the window used in this calculation. Lower values give a smoother curve, but information on lower frequencies is lost. 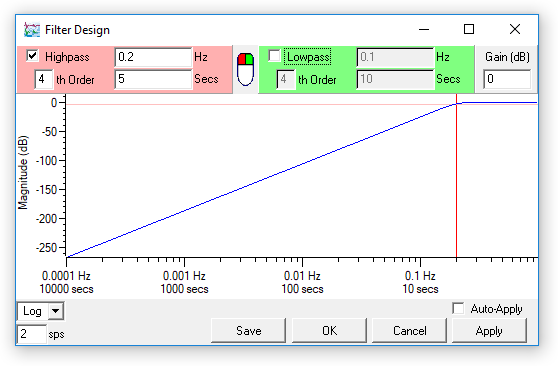 You can also choose to display the curve and filter response on logarithmic or linear axes. First, we need to measure the background noise level. To help pick out the event, we apply the default high-pass filter to the Waveview window. We will design a filter specifically for this event in the next step. Next, the event itself is selected for Use in Filter Design…. Scream! 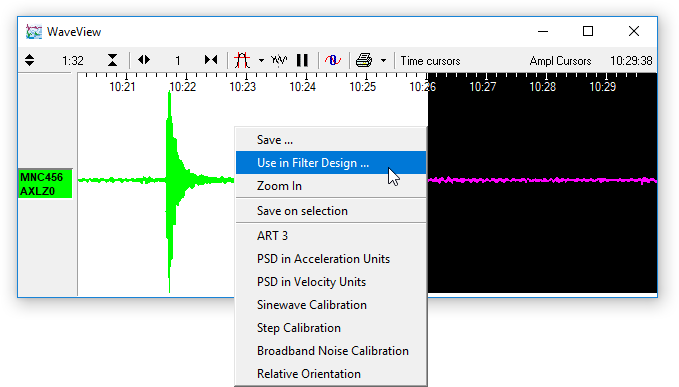 can draw the spectrum of the event on top of the background spectrum in the Filter Design widow, allowing you to identify the frequencies which are present in the spectrum of the event, but not in that of the background. 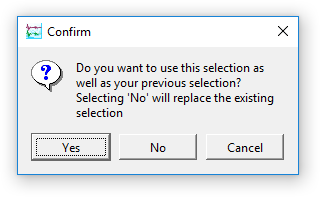 Select a period of time that covers the event and, without closing the filter design window, select Use in Filter Design… again. We can now Apply this filter to give the cleanest possible picture of the event. This filter can be saved for later use by clicking Save and entering a name for the filter. It will then appear in the drop-down menu beside the Filter Streams icon . Saved filters are stored in Scream!’s configuration file.